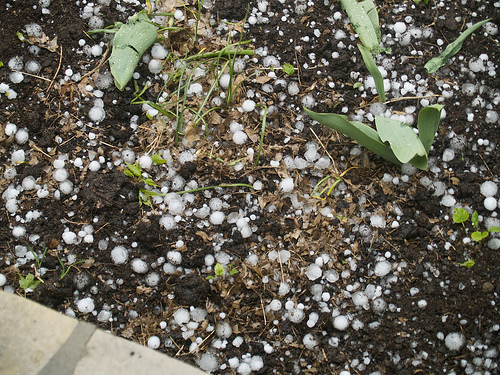 This morning, as I was just taking my first few sips of coffee and wondering how much darker it was going to get with the impending storm, I started hearing a rumbling coming from the west…it grew louder and louder until suddenly golf ball sized hail began to crash down on everything! It was rather shocking and unexpected, and I fumbled about to get the camera, so some of my images are a bit blurry. The adrenalin was pumping (I was worried windows were going to break or something, and like I said, I’d had very little coffee and it’s been a hell of a week). 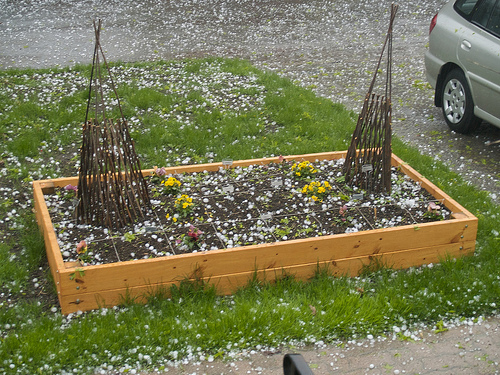 Besides my poor little seedlings taking a beating, I didn’t see any other major damage (but then again, I didn’t really venture outside much today). I noticed a garlic and a few onions are a bit crushed, and my radishes and lettuce are a bit smooshed but I think everything will survive, I hope! It’s the end for some of the tulips though.